The City's Aerial Spray Program is complete. Spraying dates: To review areas that were sprayed, view our Aerial Spray Map. Now that spraying is over, please rinse any items that may have been sprayed with water. be conducting Lampricide Treatment on the Credit River to reduce the resident larval sea lamprey population. This may cause the Credit River to turn yellow. For more information about this program, please visit http://sealamprey.org/fact-sheets.php. using Foray 48B Biological Insecticide Aqueous Suspension, containing active ingredient Bacillus thuringiensis, subsp. kurstaki strain ABTS-351, (PCP# 24977) under the Pest Control Products Act (Canada). This will be done to lower fall cankerworm and gypsy moth populations. Successive years of leaf loss due to caterpillar feeding can make trees vulnerable to disease and weather fluctuations. The City has prepared an informational presentation for residents to understand details surrounding the upcoming Aerial Spray Program. Thank you for listening to a short presentation on the 2018 aerial spray to control Fall Cankerworm and Gypsy Moth in the City of Mississauga. The two caterpillars that we’re dealing with the for aerial spray program are Gypsy Moth and Fall Cankerworm. Gypsy Moth is a non-native insect introduced from Europe and Asia for the silk industry in the 1800s. It prefers to feed on deciduous trees and has a special preference for oak and eats leaves for up to 8 weeks often going into early or mid-July. Fall Cankerworm is a native insect that’s been present in Canada for years. It feeds on a variety of hardwoods including oaks, maples and elms but it feeds for a much shorter period of time, only eating leaves for 4-6 weeks meaning that it’s wrapping up around mid to late June. Because of the high populations that we saw in 2017, we hired BioForest to monitor populations and help predict 2018 defoliation levels across known areas in the city. The areas we identified for the aerial spray program were predicted to have severe defoliation, which means 91-100% leaf loss. For Gypsy Moth, that means there’s greater than 5001 egg masses per hectare and each egg mass can contain up to a thousand caterpillars. So that means that over the average size of a football field there would be 5 million caterpillars present. For Cankerworm, there’s greater than 201 females per band to trigger the severe defoliation prediction, and one of the trees in Mississauga had close to 3000 females on the band. While we don’t expect the caterpillars to kill the trees themselves, they do weaken them to the point where other diseases and weather fluctuations could have an impact to their health and given that it’s the second or third year that we’ve seen heavy rates of defoliation in parts of the city, we would expect to see impacts to trees starting if heavy rates of defoliation continue. With the data that was collected in late 2017 and early 2018, we identified high priority areas for management throughout the city where we would expect sever defoliation. We also looked at the service requests that we would receive, so those are the calls through our 3-1-1 call centre, direct calls or emails through our office, and information via the councillors’ office to help refine the areas. We also added in our field observations from 2017 where we saw high populations or high levels of defoliation. We also looked at the natural areas within the city to ensure that we weren’t leaving pockets behind that weren’t in the spray area. This resulted in a total of 1,940 hectares (or 4,794 acres), consists of wards 1, 2, 6, 7, 8 and 11 and is predominantly located along the lakeshore and the Credit River Valley. Outside of the aerial spray zones (that you see here in red) we will be looking at other IPM tactics along the leading edge to ensure that we’ve captured the population and that we are not going to see expansion out beyond these areas. The aerial spray program consists of a seasonal spray window from April 23rd to June 10th. This would allow us to spray early if we happen to have a warm spring, but also if it is a cool spring it allows us to extend the season into June. For the spray to be effective we need the leaves emerged at about 30% and caterpillar hatch out around 100%. The reason for this is that we need Btk, the compound that we are using, to settle on the leaves and the caterpillars to be actively feeding for them to ingest the compound for it to be effective. What this means for residents is that we will have caterpillars feeding through the early stages before we can line up the spray program to be as effective as possible. Once we meet the conditions of leaf emergence and caterpillar hatch out we then start monitoring weather conditions. We need ideal temperatures, winds, humidity, and no precipitation in the forecast for the spray to be effective. Therefore, we won’t know when the spray is happening until about 48 hours in advance, at which point we will send emails out through our distribution list, update our 3-1-1 call centre, and publish it through our social media venues. The spray program itself will consist of two helicopters over three days, spraying between the hours of 5:00 am and 7:30 am, and it looks like this will happen mid-May based on current models of caterpillar hatch-out. We do need to complete two sprays three to five days apart to be most effective. Btk breaks down readily in sunshine, and its active life is only one to four days and we don’t expect bioaccumulation in the environment. Because of the short lifespan we do need to do the second spray to ensure that we’re knocking the caterpillar population back as low as possible to reduce further impacts to the tree canopy. The photo you see on your right is a photo of the monitoring tree that we’ve set up to look for leaf emergence and caterpillar hatch-out. There’s a pink dot at the base, they’ll be pink flagging tape wrapped around it with an identifier, and the gypsy moth egg masses will have white spray paint dots beside them. Please don’t interfere with these trees as it is crucial for us to refine the aerial spray window. The compound that we’re using is Btk, also known as Bacillus thuringiensis subspecies kurstaki, in the formulation of Foray 48B. This is a biological insecticide that is approved for use in organic agriculture in both Canada and the United States. It’s a naturally occurring bacteria found in the soil that is very specific to caterpillars that are feeding at the time that it’s sprayed. Btk was the compound that we used in 2006 and 2007, and it’s approved for aerial use over urban areas by health Canada and the Pest Management Regulatory Agency. We’ve been working very closely with Peel Public Health, and they do not anticipate human health impacts from the spray program. Btk also does not impact honey bees, fish, birds, or other mammals such as pets. While Peel Public Health isn’t anticipating human health impacts from the spray program, there are some recommendations that we are providing to residents that they may wish to follow. We’re recommending that you close your windows and remain indoors for up to thirty minutes following the spray program. We’re also recommending that you set your air conditioner vents to closed or choose the recirculate function. For those smaller items that can be brought indoors, such as laundry, toys and pets, we would recommend that you bring them inside. For larger items, such as lawn furniture, pools, barbeques and play equipment, we would recommend that you cover them or rinse them with water immediately after the spray program. Btk contains sticking agents that allow it to adhere to the leaf for the caterpillars to ingest but that also means that you would find a tacky residue on these items following the spray program. The sooner afterwards that you rinse them with water, the easier it will be to remove. In general hygienic practices, we would recommend that you wash your hands after outdoor activities and gardening, and to wash any fruits and vegetables that you are harvesting from you back yard following the program. Immediately following the spray program we’ll be collecting leaves to ensure that the Btk was applied at the right concentration and that we had good leaf coverage to ensure that it was effective. Also following the spray program, we’ll be taking the data from the helicopters and working with a consultant to look at deposit modelling. This will assess the information from the helicopters in relation to weather conditions to determine if there was drift or deposit off the target site that may have reduced the efficacy of the program. In addition we’ll be doing defoliation surveys to monitoring how much leaf loss actually occurred before the spray happened. In the fall we will be continuing with our gypsy moth egg mass counts and fall cankerworm banding to look at the populations for 2019 and then we will provide supports back on the success of the program. We’ve been working with a group of technical stakeholders that have an interest in the program both including internal city departments and other external groups. This consists of groups such as: Traffic Operations, Capital Works, Emergency Management, Fire and Emergency Services, Police Services, just to name a few, as well as local counterparts at the Regional, Provincial, and Federal levels. The reason to work with these groups is that there are a lot of logistics and approvals required for the program. Two of the main approvals that are required are an alternate means of notification under the Pesticide Act for the Ministry of Environment and Climate Change. This allows us to change the notification process under the Pesticide Act due to the size of the area that we are spraying. The other approval that is required is from Transport Canada for ministerial exemption for the aircraft to fly at low heights over the city. Current regulations require aircrafts to be 1000 feet above built up areas and the helicopter will be spraying 50 feet above the treetops for the spray to be effective. The approvals through Transport Canada rely on emergency plans, as well as road closures to ensure that we’re not impacting traffic. The main reason for the road closures is because of the low flying helicopters and the visual distraction that could result in traffic collisions. The road closures will be short in nature, as the helicopter completes 2 to 3 passes, before moving on to the next area. We’ll also be completing park and trail closures to ensure that residents aren’t out walking their dogs or enjoying the parks in the early hours and within the spray zone. We have developed a communications plan that is targeted and provides information before, during and after the spray program. We’re currently still in the before phase, where we’re providing information on the program. During the spray program itself, we’ll be reaching out through email, the 3-1-1 call centre, councillors’ offices and social media. After the program we’ll be providing reports on the success of the aerial spray. We’ve developed tool kits for the councillors and there is a Frequently Asked Questions document available on our website that is about 8 pages long and is a working document that will be updated as new questions are asked, to ensure that all the information is available. We’re also asking residents to complete a short survey to ensure that the communication we are providing and the information available is what residents are looking for. Following the aerial spray program we’ll be doing a follow up survey to ensure that our communications tactics were successful. We have set up a dedicated website and will be providing a lot of information though social media as well. But we also recognize that some individuals may not have internet access or be comfortable with that form of communication. So we’ll still be completing traditional methods such as letters, which you should be receiving shortly, brochures and road signs. We have been doing a series of public open houses to provide the information in the impacted Wards, and working closely with Peel public health on the program. We’ve also been working with Oakville and Hamilton who are completing Aerial spray programs this year as well. For more information and to stay in touch with us over the next few months as the spray program moves forward we do have multiple means to stay in contact with us. As I mentioned in the previous slide we are completing a survey right now on our communications strategy to ensure that we’re meeting your needs. The link is: http://ow.ly/DTVI30iPqf0. That survey link it will be short, 5 to 10 minutes, just making sure that we are providing the information that’s required. Our 3-1-1 call centre is also briefed on the program and will be able to answer questions and will provide updates on when the actual spray dates will happen as we get closer to that time. For health concerns Peel Public Health has graciously offered to field all calls, their number is 905-799-7700. They’re also working with the local family physicians in Mississauga to ensure that they’re briefed and can answer any of their patients’ questions that may come in. The City of Mississauga Facebook and Twitter as well as the Parks & Forestry Facebook, Twitter and Instagram social media accounts will be quite active during this time as well and will be using the hashtag #2018aerialspray. We also have a dedicated website for the program at mississauga.ca/2018 spray where you can sign up for the email distribution list, look at an interactive map to see if you are in or out of the spray area and the FAQ document that I spoke about earlier. We also have a dedicated email address, which is aerial.spray@mississauga.ca. We hope that that provides a high level of information for you and that you can search out more through the website or by reaching out to the numbers and addresses provided on this screen. Thank you. What areas of the City will be affected? The spray will treat areas of Mississauga expected to see severe leaf loss from caterpillar feedings. This area is roughly 1,940 hectares (4,794 acres) of private and public land in Wards 1, 2, 6, 7, 8 and 11. Check to see if your address is in the spray area. Those wanting to take personal precautions, e.g. covering items on their property, can do so. After the spray, we recommend washing down items with water. Does the aerial spray pose any health concerns? The health and safety of residents and the long-term health of Mississauga’s tree canopy continue to be top priorities. Region of Peel – Public Health is not anticipating human health impacts associated with the aerial spray program for cankerworm and gypsy moth caterpillar. Btk has been extensively studied by the Pest Management Regulatory Agency and the US Environmental Protection Agency (EPA). Btk is approved by Health Canada for aerial use over urban areas and poses minimal risk to human health when used as directed. Click here to review the Safety Data Sheet for the version of Btk being used in this year’s aerial spray. How can I receive updates about the aerial spray? Sign up for 2018 Aerial Spray News Alerts. Updates on the aerial spray will also be provided on this webpage and on the City’s Twitter and Facebook channels as well as on Parks & Forestry’s Twitter, Instagram and Facebook channels. Forestry staff will be teaching techniques for managing both fall cankerworms and gypsy moths on your property as well as explaining details about the upcoming aerial spray program. The City has prepared an FAQ document that will hopefully answer most of your questions. If you have additional questions or concerns regarding the 2018 Aerial Spray, please call 3-1-1 or 905-615-4311 from outside Mississauga city limits or send an email message to aerial.spray@mississauga.ca. What are fall cankerworms and gypsy moths? And, why do they pose a problem? 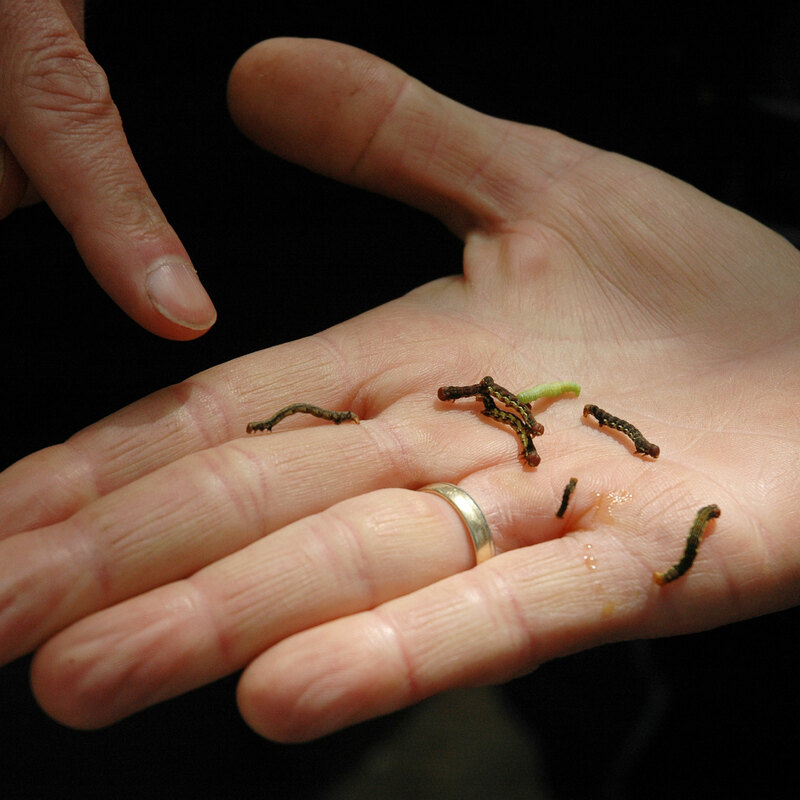 Fall Cankerworms (also known as inchworms) are a native insect found throughout the majority of Canada. Fall Cankerworms undergo natural population increases every 10 to 15 years that last for two to seven years—although, usually no more than four. They feed on tree leaves from May through mid-June and then go underground to re-emerge in the late fall as moths. They are known to feed on a variety of trees including apple, ash, beech, elm, cherry, hickory, oak and maples. 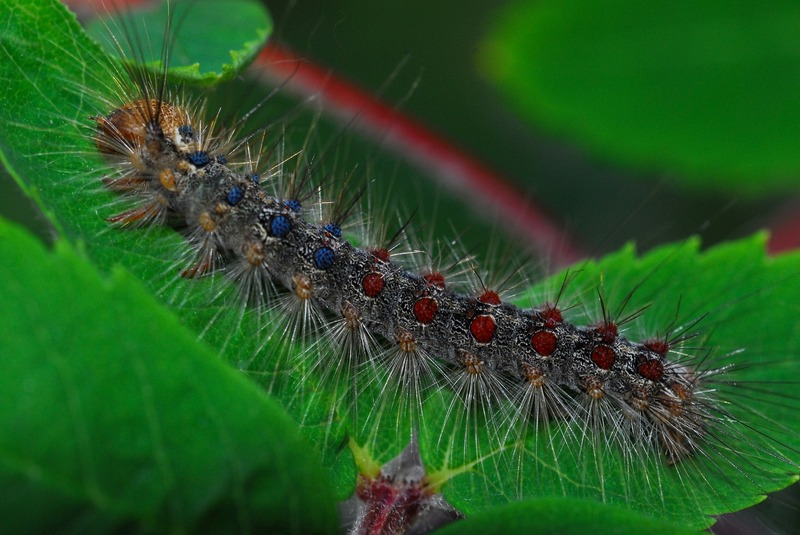 Gypsy Moths are an invasive insect from Europe and Asia. Gypsy Moth caterpillars feed on the leaves of oak and other deciduous trees. Caterpillars chew small holes or completely strip a tree of its leaves depending on its age and population. Caterpillars are five to 60 millimetres long, dark and hairy with five pairs of blue dots and six pairs of red dots on the back. What is an aerial spray and how does it work? During an aerial spray treatment program, highly trained spray specialists use a helicopter to spray an organic pesticide, Bacillus thuringiensis subspecies kurstaki (Btk), over designated areas to reduce the populations of fall cankerworms and gypsy moths. The spray will produce fine droplets that are small enough to stick to the leaves of trees. Btk produces a protein that is toxic only to the larvae (caterpillars) of specific insect species. When ingested by susceptible insects, the toxic protein molecules destroy the walls of the insect’s stomach. The insect usually dies within two to five days. Although the aerial spray won’t eradicate all fall cankerworms and gypsy moths, it will lower populations to a more manageable level. When will the aerial spray occur? The City has contracted Zimmer Air Services to implement the spray sometime between April 23 and June 10, 2018, between 5 and 7:30 a.m. The spray dates will be determined by a number of ecological factors (e.g. leaf size, caterpillar size, weather) and will be communicated to residents at least 48 hours prior to the commencement of the spray. The City has made a series of videos to help demonstrate some of the techniques mentioned above.